A team of students from Triadelphia Middle School in Wheeling earned fourth place among 26 teams and earned two special awards at Saturday's Pittsburgh Regional Future City Competition. A team from Warwood School also won two special awards. The event, which was held at Carnegie Music Hall in Pittsburgh, asked students to create a city displaying residential, commercial and industrial areas; power plants; transportation systems; communications systems; and other infrastructure. Students addressed important issues such as pollution, traffic density, taxes, and budgets while creating their city. This year students were asked to focus particularly on water recycling. The fourth place finish by the Triadelphia Middle School students was one of the highest in the seven years that teams from Wheeling have been competing. The Ohio County Schools teams were the only entrants not from Western Pennsylvania. The teams took part in a dress rehearsal at the Center for Educational Technologies® on Jan. 13. In addition to the overall award, Triadelphia Middle also was honored for designing the best communications system and creating the best energy system. The engineers who judged the competition cited Warwood School students for designing the best city layout as well as the best bridges. Winning the overall competition and a trip to the national finals in Washington, D.C., in February was a team from Mary Queen of Apostles School in New Kensington, PA. Second place was St. Bede School from Pittsburgh, third was Trinity Middle School from Washington, and behind Triadelphia in fifth was The Ellis School from Pittsburgh. Doing the presentation at the Pittsburgh competition for Triadelphia Middle School were Samantha Dodd, Anna-Marie Phillips, and Rebecca Sellers. Blake Humphrey was the alternate presenter. Other team members are eighth-graders Bradley Forte, Scierra Hill, Christina Klug, Erika McNeil, Elijah Pond, and Correy Ream and seventh-grader Shaun Bishop. 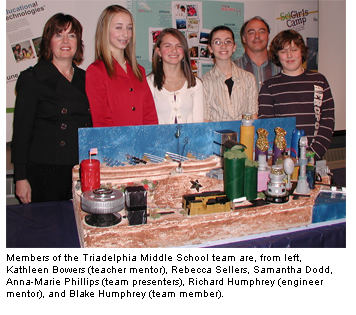 The teacher mentor for Triadelphia is Kathleen Bowers, and the engineer mentor is Richard Humphrey. Presenting for Warwood School were Colter Fragale, Devyn Nickerson, and Garrett Weigel. Samantha Criswell was alternate presenter. Other team members are Audrey Clark, Jay Coleman, Alex Freshwater, Julie Maynard, Seth Porter, Noah Salvatore, Ike Tan, and Zach VanHorn. The teacher mentors for Warwood are Mary Ann Muir and Carrie Jones. The engineer mentor is Richard Eberhard.